66 Square Feet (Plus): SA Blog Awards 2010 - is anybody out there? By chance last night (already the 1st of September in SA) I noticed that a visitor to (the Food) had come from the Awards website, where finalists were to be posted today. 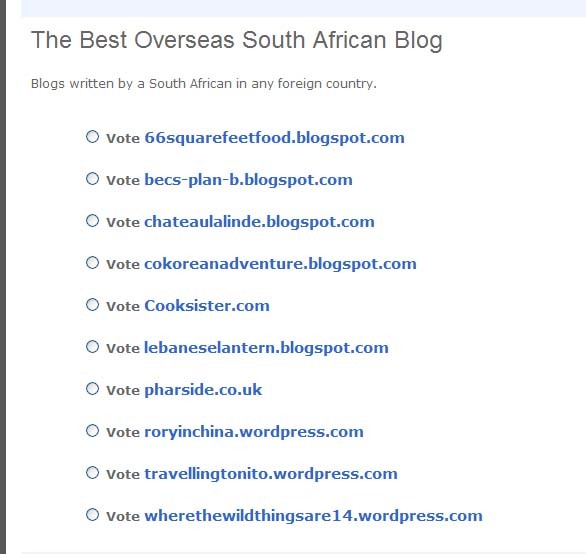 So I went over there and found, to my utter surprise, that (the Food) has been listed as a top ten finalist in the categories for Best Photography and Best Overseas Blog. This blog, 66 Square Feet, is nowhere to be seen. And this is the blog that 1. receives the traffic and 2. received the most nominations from you, dear Readers (based on the comments and emails I received). For Photography and Overseas. (The Food) had an outside chance in the category of Food and Wine, in my opinion, because of its lower traffic and high competition from other food blogs. Shake the nearest tree and a food blog falls out. So how on EARTH did (the Food) land in the two categories for which 66 Square Feet was nominated, and for which, logically, it is a strong contender? 1. I had trouble registering both my blogs, once they had been nominated. I wrote to the Awards on August 25th, heard back once (All they said was, cryptically, "Which categories?" - huh?). After I wrote that I imagined Photography and Overseas for this one, and (the Food) for well, Food, I did not hear back. Apparently it was not resolved. Kyk hoe lyk ek nou! 2. I think, because of the similarity in the blogs' names, and url's, some one made a mistake and mistook (the Food)'s url for this blog's url. 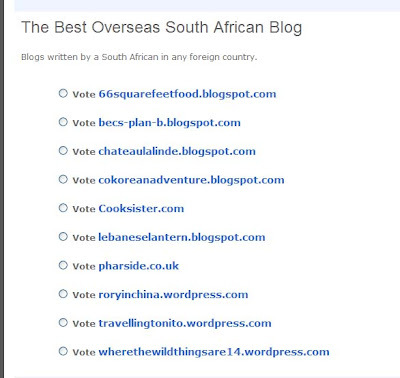 So now I have a Food blog erroneously (in my opinion) competing for best Photography and Best Overseas blog. When the real action is here! AAAAAAAAAAAAAAAAAAAAAAAAAAAAH! This blog is a contender (Marlon Brando rasp - I coulda bin a contenda!). (The Food) is about...food. The photography is here. Most of the content is here. More disturbingly, my own feelings aside: if a mistake - as I believe this to be - this elemental is made: if a url is not checked; if registration is not confirmed, if the finalist is not even notified by email prior to the finalists' publication (as promised) on the website, and, above all, if the actual nominations take a backseat to an individual Award-employed human's faulty decision-making then the process is deeply flawed, and its integrity must be questioned. In response to my first email I was told that (the Food) didn't get enough votes to be a finalist in Food. I expected that. Fine. No worries. But with tears in my eyes, I ask you how it jumped into those other two categories, ahead of this blog? My second email said that their explanation was unsatisfactory, and I have asked, again, whether they can double check their facts, and replace (the Food) with 66 Square Feet in the finals, as I believe, truly, that this was a sloppy mix up of urls. I know this may all sound silly, and remote, if you are not in South Africa. But I like the idea of the SA Blog Awards. I love promoting South Africa. And am eager to meet new readers through this exposure. But if the process is this prone to error, what are the awards really worth? If it cannot be fixed, I shall have to decide whether to compete actively, turning my energy next door, happy that more people have found (the Food), or whether to sulk, and sit it out in principle. And if you have been receiving constant emails from the Awards, I am really sorry. It seems to have been an unforeseen (by me) consequence to readers who were good enough to nominate blogs. 9-1-10, 7pm: This has been corrected! 9/30/10: an Open Letter to the Organisers of the SA Blog awards, by Cook Sister!, a finalist in best Overseas and Food and Wine and previous winner and sponsor of the awards. Sounds like you are being robbed, and I think you are way calmer about it than I would be. Unfortunately, it also sounds like your emails may be going to different people so that no one understands the whole issue. Good luck getting it fixed, tho. One of the real downers of this electronic age is that ofter a good old human who will/can listen is hard to find. Is there a phone number?? If you get it straightened out, or if you want us to vote for food, please let us know. Oh dear! I see, immediately, the problem. There has been catastrophic global warming in the Southern Ocean, The Indian Ocean has completely dried-up and South Africa has become part of a new Gone-Wandered - Land and is now connected to this wide brown land. YOUR BLOG AWARDS NOMINATIONS HAVE BEEN MIXED UP WITH OUR BALLOT PAPERS! webb, I was not calm last night. Not calm at all. dinahmow, you have it!!!! Must I assume office in Oz? May I have my own koala bear? I had a collection of 12 when I was little. Thanks, Paul, and I am really so pleased about that. Introducing people to South Africa is one of the greatest rewards I can think of. Hi. I completely understand your frustration in trying to get hold of these guys. Please can you let me know which email address you were eventually able to get through to them on? I've tried awards@ nominations@ info@ and admin@ but they've gone radio silent for days! However they have not replied to my last three emails, starting with when I let them know that the url for my blog that on they gave the Media 24 website was incorrect. I did, however, get a response from Media 24.